FRISCO, Tex. – The Dallas Stars announced today that the hockey club has signed right wing Raymond Sawada to a two-year entry level contract through the 2009-10 season. He has been assigned to the Iowa Stars – Dallas’ primary developmental affiliate in the American Hockey League (AHL). 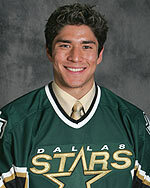 Sawada, 23, was selected by Dallas in the second round (52nd overall) of the 2004 NHL Entry Draft. He just completed his senior season at Cornell, scoring 10 goals with 16 assists for 26 points in 36 games. The 26 points marked a career-high. Sawada served as co-captain of the Big Red this season. The 6-2, 205-pound forward finished his Cornell career with 31 goals and 45 assists for 76 points in 137 games. He ranks just one appearance shy of Cornell’s all-time record for most games played (Jeremy Downs – 138 games). Sawada is expected to report to Iowa immediately, where the club has 10 games left in the regular season.